After the healthy Tuna salad recipe, here is yet another Canned Tuna recipe. A spicy stir fried Tuna recipe will pairs best with breakfast bread. I am not an addict of canned foods. 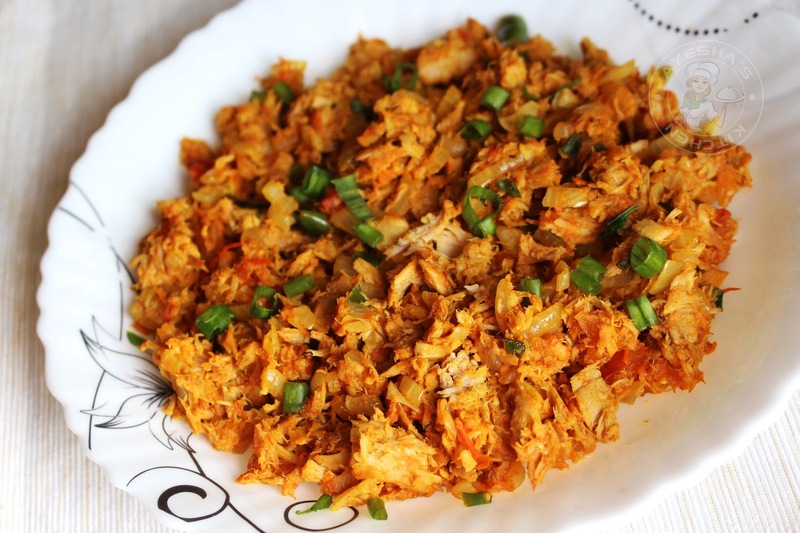 But it is very simple to throw drained canned tuna for a quick breakfast and dinner side dish. Years back, i still remember the first time i deal this canned tuna. Don't know what to do and i was thinking how can i turn them into something eatable. My hubby told me to make some stir fry with it as he heard from his uncle that it tastes awesome. Some how i managed to make a stir fry which was not so good, i should say. It smells more fishy. But now, things changed me up. This stir fry tastes really good and is a must try recipe for those who loves simple and quick recipes. I think canned tuna tastes good than the fresh tuna recipes or Tuna curry. This fish is also named as choora in malayalam. Hope you all give this simple tuna recipe a try in this busy life. 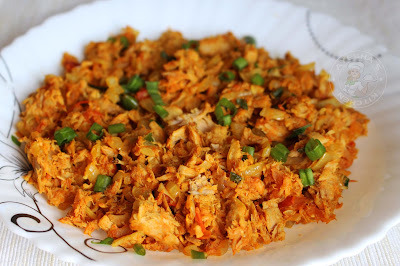 So lets see how to make tuna fish / canned tuna stir fry recipe / can tuna recipes / easy tuna recipes / choora thoran /tuna dinner recipes /canned healthy tuna fish recipes / recipes with canned tuna. Drain the canned tuna and set aside. Now heat a pan with oil. Saute green chilies, garlic julienne for a while and then add finely chopped onions to it. Saute it until the onion becomes soft and transparent. When done, add the chopped tomato along with some salt. Cover and cook until the tomato goes mushy. Then add the spice powders and saute for a while. To this, add the canned Tuna and combine very well. Scramble it very well and stir fry until it become dry. Garnish with chopped spring onion. When done, serve hot along with Dosa, Indian bread or chapati. You can add the spice powders as per your taste and preference.